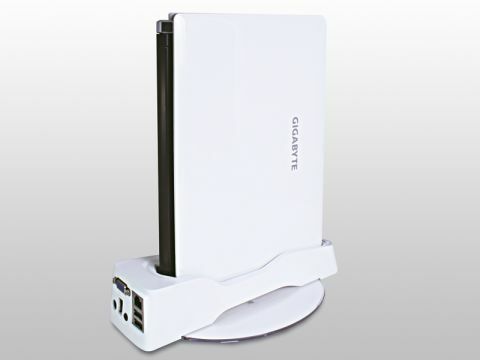 Gigabyte's netbook range comprises unique designs, and this can be particularly seen with the M1022 – also confusingly known as the Booktop. The glossy white chassis weighs 1.4kg, and its smooth finish makes it easy to carry. The plastics used feel very sturdy to the touch, but the white finish inevitably attracts a great deal of dirt and smudges. Unlike some rivals, the large 6-cell battery is neatly integrated into the main body. This helps maintain a clean look across the chassis, while also allowing the device to run for an impressive 360-minutes away from mains power. Usability is excellent. Some punctuation keys on the keyboard have been made smaller to make room for the main keys, but the board moves with a smooth and quiet action. The touchpad is slightly less usable, however. Measuring 65 x 32mm, it is unusually wide. It also has its mouse buttons fitted on either side of the touchpad, rather than below it. The 10.1-inch screen is more pleasing. Encased beneath a sheet of glossy plastic, it sits flush with the bezel. Brightness, colour and contrast are all excellent, although the glossy coating is extremely reflective – more so than many of its rivals. A stylish docking station is included. The M1022 slots vertically into the plastic stand. A VGA-out port lets you connect to an external monitor and three USB ports and an Ethernet connection are in place. An integrated HSDPA module provides wireless broadband internet access. The SIM card slots beneath the battery and is easily replaced. Strangely, DVD playback software is also installed, which is unusual for a device with no DVD drive. On its own merits, the Gigabyte M1022 is a functional, if a little unremarkable, netbook. The inclusion of its docking station makes it far more usable and turns it into a neat little desktop replacement, so it's a great choice for working between the home and office.